A month before the wedding, I asked Jess if there was anything in particular she needed gift-wise. 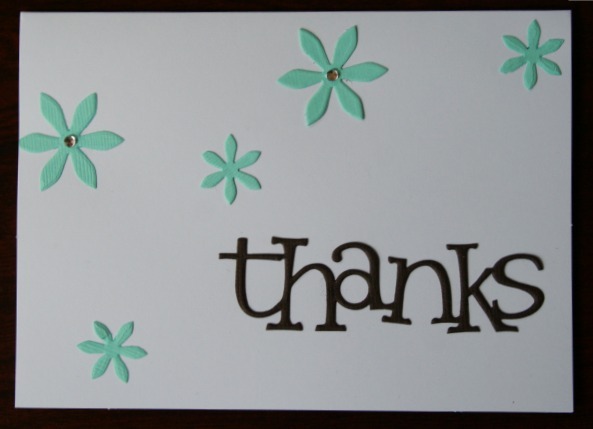 She asked me to make her some 'Thank You' cards. Uhhhh, buying paper, ribbon, cuttlebug supplies, ink and an embossing tool for an actual purpose?! SWEET BEANS! I think it was my first guilt-free trip to the craft store ever. I ended up making four different designs, 48 in total. I thought if I just did one style I would get bored. 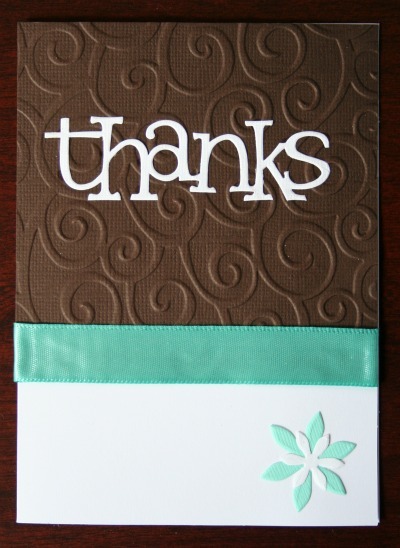 The 'thanks' lettering comes from the 'Olivia' alphabet set (by Provo Craft, aka Cuttlebug). I found it on sale at Walmart and from what I gather, it's becoming hard to find. I'm thinking Ebay or Amazon is your best bet to nab one. 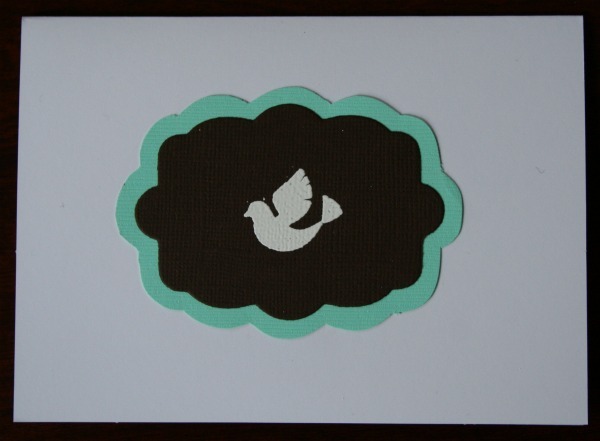 I left the little embossed birdies blank in the event they don't need all the cards. 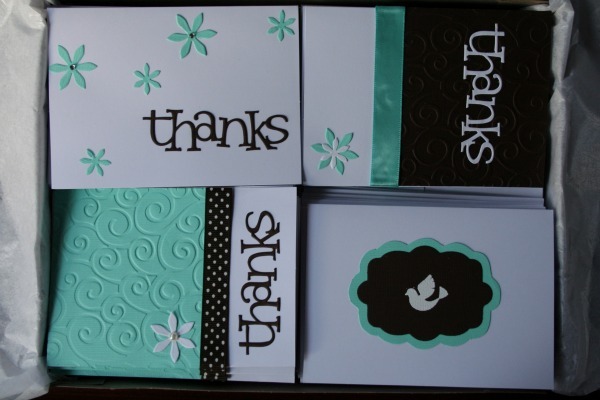 These little babies can be used as regular note cards. Oh man, I love my cuttlebug. 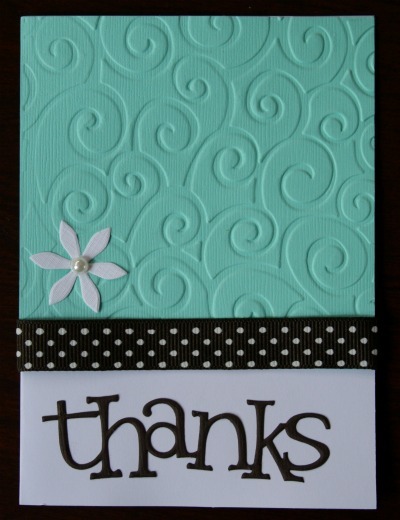 I used it to cut the 'thanks' lettering, flowers and decorative frame and emboss the paper. *Sigh* that was a magical afternoon. I think they took 4 days to complete (my concept of time is shot to hell) as I did most of my work during nap time and after R-man went to bed. Two other things that helped: watching 'The Tudors' on Netflix and eating 'Toppables' crackers. Ahhhhhhhh mat leave! love love love...these are adorable!!!! I'm so jealous of you!!!! *LOL* Great job!!!! I am going to try one of these. I am excited about the layout. Thank you so much for sharing your ideas, going to give one of them a try. Your cards are beautiful! came across on Pinterest, that's how I found your page.